The term “Jewish origins” is highlighted in this article in Ta Nea, 9 February 2015, p. 15. This week, media outlets associated with the International Consortium of Investigative Journalists (ICIJ), including the Guardian, Le Monde and BBC Panorama, began publishing findings from their research on a trove of almost 60,000 leaked files from HSBC’s Swiss subsidiary that provide details on over 100,000 clients and their bank accounts. The new data shows that there were at least 2,148 Greek clients with accounts at the HSBC, which is 86 more than is contained in the Lagarde list held by the authorities. A former finance minister, Yiorgos Papakonstantinou, is facing trial for removing the names of three relatives from the version of the Lagarde list originally received by the government from the French authorities. In Greece, the ICIJ’s local partner in the SwissLeaks project is Ta Nea, one of the country’s biggest mainstream newspapers. Ta Nea is in possession of the additional Greek names, 41 of which it says have deposits of over €1m euros. For reasons only known to itself, Ta Nea has decided to specify the religious background of one family and one individual among these large depositors. The piece refers to a “well-known family of Jewish origin, whose members were born in Athens, Thessaloniki and Tel Aviv” as well as to a “rentier of Jewish origin who was born in Thessaloniki”. It’s important to point out that the religious affiliation of the other account holders on the list is not provided. 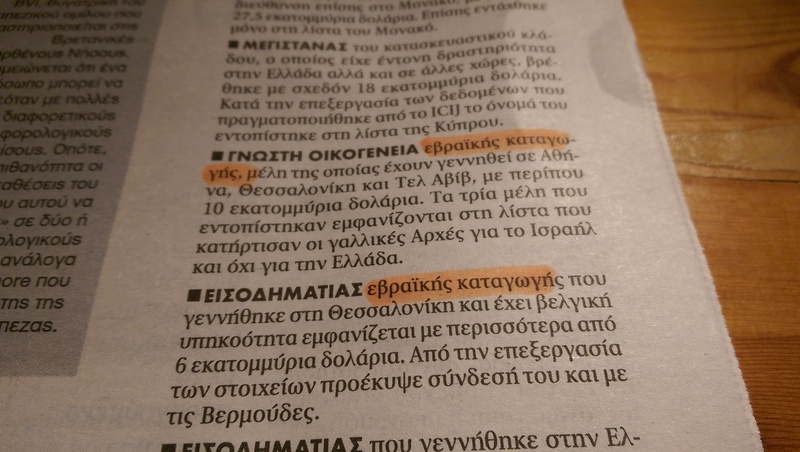 So, readers are not informed if the “businessman involved in shipping and born in Chios” or “three brothers born in Greece” are Orthodox, Catholics or atheists. Not that this information would be of any relevance.